New Zealand XI 7-349 (Hamish Rutherford 90, Corey Anderson 67, BJ Watling 66*, Graeme Swann 2-53) and 7-334 (BJ Watling 89*, Tom Latham 48, Joe Root 2-42) beat England XI 426 (Ian Bell 158, Alastair Cook 60, Jimmy Neesham 4-73) and 9-256 (Matt Prior 68, Graeme Swann 41*, Mark Gillespie 4-87) by three wickets. BJ Watling plundered 155 runs and grasped seven catches behind the stumps in the game. England XI amassed 426 runs in the first innings and declared their second for 9-256. New Zealand XI declared their first innings after scoring 349 for seven wickets and achieved the target of 334 set by England XI with three wickets still in hand. The four day tour match was played on February 27, 28 and March 1, 2, 2013, at Queenstown Events Centre. Earlier, the captain of New Zealand XI, Tom Latham, won the toss on day one and offered the batting to the visitors. England XI started off with their skipper, Alastair Cook along with Nick Compton and they scored 45 runs when the latter was gone for 21. The tourists lost their third wicket at 81 as Jonathan Trott and Kevin Pietersen lost their wickets for 1 and 14 runs accordingly. Ian Bell joined with Cook and they added another 43 runs when the latter became the next victim after scoring 60 runs. Ian Bell took over and consolidated the innings of the tourists with a reasonable support from the incoming batsmen. Joe Root and Matt Prior made the individual contributions of 49 and 41 runs respectively as Bell powered his century. Graeme Swann scored 27 as Ian Bell was the last English batsman to be dismissed after thrashing 158 off 233 balls with 23 fours as England XI was bowled out for 426 in 103.2 runs. Neil Wagner and Jimmy Neesham were the highest wicket takers with four each whereas Mark Gillespie and Carl Cachopa shared one wicket each. New Zealand XI lost their opener Tom Latham for 16 as Hamesh Rutherford secured his end when the two new batsmen, Carl Cachopa and Neil Broom, scored 6 and 14 runs. Dean Brownlie played a solid knock of 63 and lifted the score to 175 when Rutherford missed his ton by 10 runs and was clean bowled by Chris Woakes. Dean Brownlie went past his fifty and was caught behind by Matt Prior off Trott for 63 as BJ Watling and Corey Anderson demonstrated classic cricket under trying conditions. Anderson managed 67 and BJ Watling was playing at 66 when Latham declared the first innings for 349 after utilising 95 overs. Graeme Swann held two wickets whereas Stuart Broad, Graham Onions, Chris Woakes and Jonathan Trott got one wicket each. England XI lost their first wicket at 19 as their top order surrendered and they were reeling at 4-67 in 17.4 overs. Alastair Cook, Nick Compton, Jonathan Trott and Kevin Pietersen lost their wicket for 24, 1, 20 and 8 runs as Matt Prior consolidated the innings. Prior became the sixth batsman who was dismissed after scoring 68 runs and Ian Bell was caught and bowled by Cachopa for 38. Graeme Swann scored 41 unbeaten runs as the innings of England XI was declared for 256 after losing 9 wickets and gaining an overall lead of 333 runs. Mark Gillespie was the most successful bowler with four whereas Neil Wagner and Carl Cachopa claimed two wickets each. Tom Latham and Hamish Rutherford gave a nice opening start of 56 runs as the latter became the first victim for 33. Cachopa was unable to open his account and Neil Broom associated with his skipper and enhanced the score to 121 when Latham was caught behind by Prior off Swann for 48. Broom followed him after eight runs for 41 and New Zealand XI was struggling at 5-154 and looked like losing the encounter. 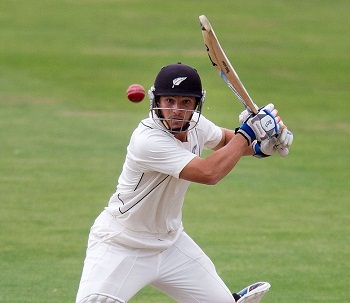 BJ Watling lifted the hopes of the home side and Corey Anderson was supporting him well from the other side. The duo shared a 82 runs partnership for the sixth wicket as the stumps of Anderson were shattered by Root for 44 runs. BJ Watling stood firm at the crease for 89 off 122 deliveries with 2 huge sixes and 8 fours as New Zealand XI reached the target by hammering 334 runs for the loss of nine wickets. Stuart Broad, Chris Woakes and Joe Root were the top wicket takers with two each as Graeme Swann got one. New Zealand XI won the important tour match with a margin of three wickets against the mighty England XI.